Attention sports fans! There are a number of sports-related programs happening at YU. On Sunday, May 6, Coach Johnny Halpert will be recognized for his 40 years as coach of the YU Macs men’s basketball team with a special tribute and naming of the basketball court in his honor. An endowed scholarship has been established at Yeshiva College in Coach Halpert’s name to honor his significant contributions to Yeshiva University and the Maccabees. 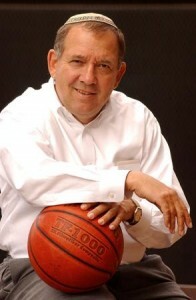 To support the Coach Jonathan Halpert Scholarship visit www.yu.edu/support/halpertfund. A special thank you also goes out to the members of the event committee who helped organized the tribute: Daniel Aaron ’90YUHS, ’94YC; Eli Davidoff ’86YC; Albert Faber ’70YUHS, ’74YC; Rafi Halpert ’00YUHS, ’05SB; Yehuda Halpert ’93YUHS,’97YC, ’05R; Tzvi Himber ’91YC; Lance Hirt ’87YC; Lior Hod ’88YC; Mark Hoenig ’74YUHS, ’78YC; Aaron Kinderlehrer ’69YC; David Kufeld ’76YUHS, ’80YC; Steven Kupferman ’97YC; Jan Levine ’98YC; Martin Liebovitch ’11SB; David Neiss ’96YUHS, ’00SB; Stuart Poloner ’71YC; Robby Rosenbloom ’81YUHS, ’85YC; Shabsi Schreier ’81YUHS, ’85YC; David Shaulewicz ’09SB; Harvey Sheff ’82YC; Elliot Steinmetz ’02SB; Yudi Teichman ’89YC. The Annual Athletics Awards Banquet on Wednesday, May 9 in the Max Stern Athletic Center will honor athletes from YU’s 14 athletic teams for their hard work and sportsmanship throughout the season. Special recognition is given to student athletes who have played on a team for four years; the Henry Wittenberg and Red Saracheck awardees, the wrestler and basketball player whose leadership and teamwork best represented the legendary coaches; male and female athletes of the year; the Aaron Meyer awardee, the student athlete who demonstrates a real sense of selflessness and spirit to his or her team; and many more individual coach and player awards. According to John Czarnecki, YU assistant athletics director, “Every year, the athletics department looks forward to this opportunity to honor our student athletes and their achievements throughout the year. Our players and coaches work hard during the season, and the banquet is a night to relax and enjoy the camaraderie and friendships that have formed among all the teams throughout the season.” For more details about YU’s sports teams, alumni can visit www.yumacs.com, the University’s official website for intramural, recreational and varsity athletics. The Athletic Department isn’t the only way to enjoy sports with YU. The Office of Alumni Affairs will be hosting our third annual event at Citi Field. All YU graduates are invited to watch the Mets take on the Atlanta Braves on Sunday, September 9. Alumni who were members of the YU baseball team are invited to a “mini-reunion” at the game. Families are welcome and free YU swag will be given to anyone who attends the game. For more information, contact alumnievents@yu.edu.